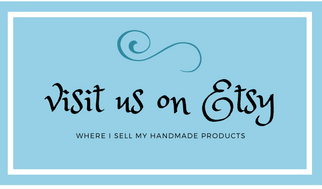 As you all know I do lots of different types of crafts to share with you and many of them have very detailed up close work that has to be done. As I have gotten older, it has gotten increasingly difficult to see that very detailed work due to the normal aging process of my eyes. Many times I have to get the strongest light I can find and magnifier glasses to see what I am doing. 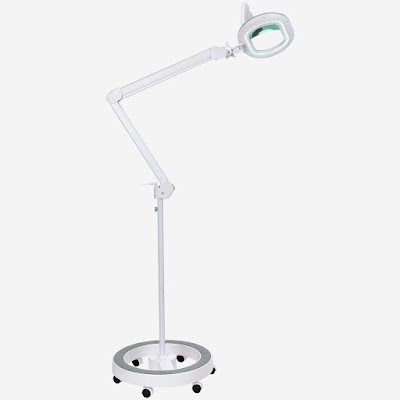 So, when Brightech contacted me and asked if I would like to try one of their magnifier lamps I was ecstatic. Following is a review of what I received. I chose the LightView Rolling Base Magnifier Light. I liked the fact that it was on a base that could be rolled about to the different areas I work in. I am constantly moving about the house to do my projects and needed something that was easy to take with me. 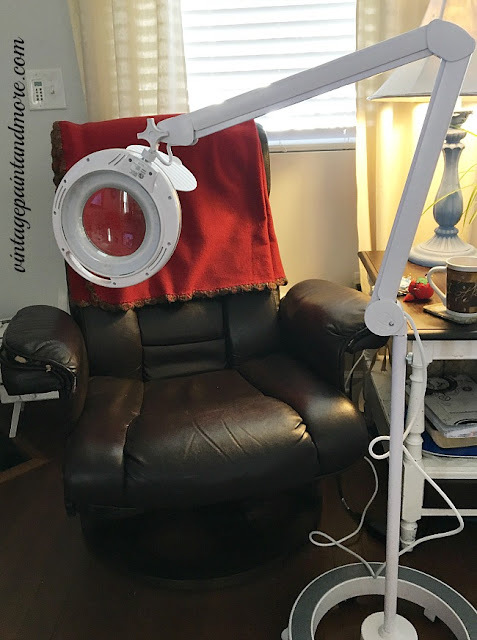 This light is on a very sturdy, weighted base that takes up very little floor space - so very important to me as sometimes I am working in a small cramped space. It has 6 wheels on the base that move quite easily from tile to wood to carpet keeping it steady so it doesn't tip - this is also a very important feature for me as I move about the house. It stands about 5' tall when it's fully extended. It has a flexible and multi-jointed arm that can be arched at an angle or raised to about 34" staying where you place it - quite versatile in its ability to adapt to your area. 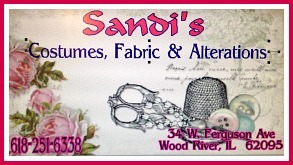 Below I am using it while doing some fabric flowers in my comfy chair in the family room. But, I can easily roll it to my craft table, kitchen table, or even out to my porch when I want to enjoy the cooler weather. I love that I can take it wherever I feel like working that day. The magnified portion has a large area for you to see what you are doing. It actually magnifies up to 225% - that's a lot of magnification for those tiny little areas I work in - like the 22-count counted cross-stitch I like to do or the very tiny detailed painting and lettering. It also has a dust cover to protect the magnifier glass from dust and scratches. 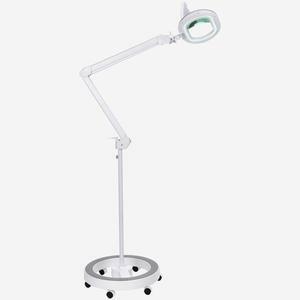 The magnifier lamp is amazing with its ability to go from reading to working on intricate projects with just the touch of a finger. The light will last up to 100,000 hours and has 60,000 miniature LED lights that produce the amount of brightness you need without generating any heat. This is a big plus for me - as my photography lights generate enough heat without adding more from another light. The light arrived in just 2 days after Brightech notified me of their shipping it. It arrived in a very carefully packed box - I was actually impressed with all the packaging. 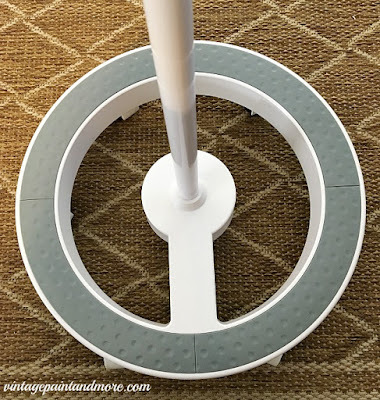 It is quite simple to set up - I was able to put it together in less than 5 minutes time. I love the overall look of it - the white fits in with our decor so well that I don't mind leaving it sitting in whatever room I am working. 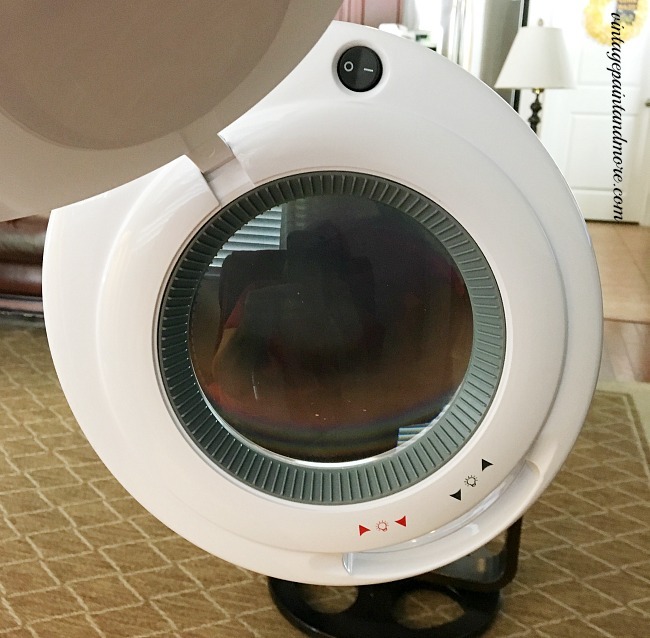 It doesn't look like a piece of equipment. I'd also like to mention Brightech offers a 5-year warranty on this light. I am doing some holiday crafting and will be sharing that with you soon. So, until then - have fun creating something you love.